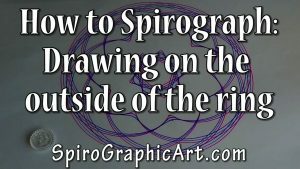 ← New Basic How-To Spirograph Video! Have you ever drawn designs on the outside of a Spirograph ring? They’re called epitrochoids, as opposed to hypotrochoids which are drawn inside the rings. Epitrochoids have their points on the inside and big arching swoops on the outside. You can fill a letter-size paper if you use a large wheel, as I did in the video below. How many points will you get? It depends on the same mathematical formula that determines the number of points of a hypotrochoid. You don’t have to do the math, though. Just use this Table of Spirograph Points in the reference section of this website. Once you’ve drawn your epitrochoid, try drawing a design inside the ring to match it before you take the ring off the paper, as I did in the video. Here’s another idea: use it as a picture frame or greeting card with a photo or message on the inside! You can also draw an epitrochoid around another wheel, rather than a ring. Try it. Drawing around a Spirograph rack, or around open shapes made with Super Spirograph parts, also creates epitrochoids, but that’s a subject for another video. You can also draw epitrochoids by having one wheel revolving around another. Try wheel 63 outside wheel 64 and changing pens after every 16 cusps. Sorry – only for owners of the classic set. Ha ha, indeed! Or the new Super Spirograph, I believe. Someone correct me if I’m wrong. Speaking of greeting cards, Heather: Do you have recommendations on which papers work best for spirograph images? Right now I just have the basic Spirograph-brand toy and dinking around on copy paper. I want to get some of the Wild Gears sets and make really nice cards for the holidays. I might also want to frame some for home decor. Thanks much! I’ve made some really nice cards using Strathmore pre-cut and folded cards that you can buy at office supply and art supply shops. They come in lots of different sizes and paper types. I’ll take some pictures now and make a post about it. Any paper will do if the ink doesn’t smear, which some gel pens may do on coated papers. You could even make designs on boxes – or on walls, I suppose, though I haven’t tried it. I’ve used glitter and metallic gel pens on the Strathmore cards and they look great. Sorry for the delay; I missed seeing your comment earlier.